The third instalment of my adventure is a review of Denver Fabrics. I had an unremarkable order from them earlier in the year (fabric nice, price good, shipping fine), so I decided to order again in October. Their website is not brilliant. The search function lacks finesse, and the categories make it hard to browse without thousands of results showing up. It also lists a lot of sold out items - I don't know why. I find it annoying. However, they do have a huge range of fabric. It's all low or medium priced - not so much designer fabric, but they do have some reorderable silks and other nice things. Shipping costs are low, but that is because they only offer one type of international shipping (Priority International Mail via USPS). It cost about $12 to ship 8 yards of fabric and a few notions. It took about 8 days between ordering and seeing the shipping notification - this is a pretty long wait. I don't know what that delay was. And, as of Friday December 28th, that is where it remains. I asked them to follow up on November 21st - they got back to me the next day, saying that the hurricane (Sandy) was delaying shipping. Which would make perfect sense if Missouri and California weren't both thousands of kilometres west of there. 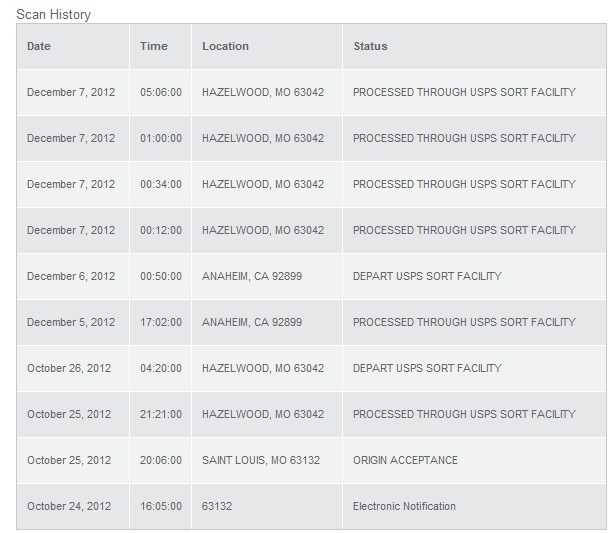 On December 10th, I asked them to follow up with USPS why it went from CA back to MO - that's the wrong way! (you can't make an inquiry direct with USPS from overseas, the sender has to do it). Three days later, Denver Fabrics said they would 'keep an eye out' for the parcel if it was returned... um, that's the barest minimum you can do. On the 20th, they said they still hadn't seen it. I, yet again, asked them to follow up with USPS but no response yet. Frankly, I think I've wasted about $150 and Denver Fabrics couldn't care less. Again, all I've asked is that they put in an enquiry with USPS. So, Denver Fabrics, I won't bother with you again. I get that you don't control the post, but you DO control your customer experience. I got an email from Denver Fabrics overnight. Apparently the parcel was returned to them yesterday because it didn't have a business name to send it to. This makes no sense, because I've bought from them previously with the same address details and no problems. Anyway, I've gladly accepted their offer of a refund on my credit card. Phew! Ooohhh, not going to try this place at all. My son orders his sports shoes on line (really good service, quick delivery and amazingly cheap prices). We love watching the shoes 'travel' around the USA - one pair even went to Hawaii! I normally like watching the travelling packages... as long as they get to the destination! It's great when you find a good store though, it sounds like you're onto a winner with the sports shoes. I had a somewhat similar experience with USPS but a better experience with the company I was buying from (not Denver Fabrics). I watched the tracking as my express parcel bound for Australia went from Los Angeles to Canada (! ), scanned in, processed, and then nothing for two weeks. I told the seller and they immediately reshipped my order. After that, someone in Canada worked out that it was in the wrong place and next thing it popped up in San Francisco, and then to Australia. So I eventually ended up with two of my order. It must have been a bit annoying for the seller, but I'm a happy customer and will go back. I hope your fabric turns up eventually. Thanks for the tip about Denver Fabrics. That's the customer service I like to hear about! Denver Fabrics couldn't even be bothered to put in an enquiry with USPS. That shows their level of commitment, I think. Steph at 3 Hours Past has just put up a new blog post about buying fabric online, too. Great that we can all share our experiences! I am strangely scared of shopping for fabric online. It could be because I can't feel the fabrics, textures etc which I love to do but also because, while there are loads of very good experiences blogged about, there are also lots of bad ones. Like yours. Hmmmm. I think I'll stick with the bricks n mortar kind of fabric stores. For now. Thanks for the warning about Denver Fabrics and I wonder when your package will turn up. At your place. I mostly like to touch the fabric too :-) I just feel so constrained by what's in the stores here, both in terms of fabric variety and the price. I was willing to take a chance where the discount made it worth the risk... which obviously didn't pay off here! Oh well, live and learn. As you said, it's interesting to read about other people's experiences.